On 18 June 2018 the House of Commons Standing Committee on National Defence presented its report to Parliament on Canada and NATO. While most of the recommendations were a continuation of current policy, the one on NATO and nuclear weapons most certainly was not! That the Government of Canada take a leadership role within NATO in beginning the work necessary for achieving the NATO goal of creating the conditions for a world free of nuclear weapons. That this initiative be undertaken on an urgent basis in view of the increasing threat of nuclear conflict flowing from the renewed risk of nuclear proliferation, the deployment of so-called tactical nuclear weapons, and changes in nuclear doctrines regarding lowering the threshold for first use of nuclear weapons by Russia and the US. The Committee also asked the government for a formal response to its report. This courageous and landmark recommendation is the result of a lot of work, not only by Committee members and staff, but by many civil society organizations and the countless Canadians who support them. But our work has just begun. It will take even more collective efforts if we are to have any chance of the Justin Trudeau government acting on it. So let’s start with getting our PM more in touch — literally — with this issue and what it means to Canadians and indeed people all around the world. The timing could not be better. On August 6th and 9th, respectively, the world will be commemorating the terrible atomic bombings of Hiroshima and Nagasaki. 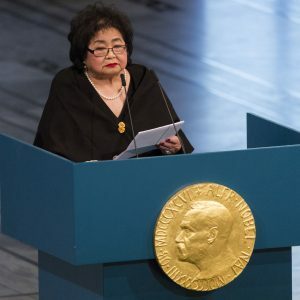 Hiroshima bomb survivor and now Canadian citizen Setsuko Thurlow was honoured for her tireless efforts to achieve a world without nuclear weapons by being made co-recipient, with Beatrice Fihn, of the Nobel Peace Prize awarded to ICAN — the International Campaign to Abolish Nuclear Weapons — on 6 October 2017. Inexplicably, Prime Minister Justin Trudeau has refused requests from Setsuko Thurlow, and from her Member of Parliament, Liberal MP Ali Ehsassi, on her behalf, for a meeting to discuss steps Canada can take to help achieve nuclear abolition. This shocking indifference must change.